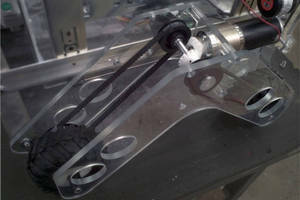 New Hyde Park, NY - Stock Drive Products / Sterling Instrument - SDP/SI announces the donation of components to Team SpacePRIDE for the NASA Lunar Rover Challenge 2013 enabling the team to better compete by improving robotic and automation technology for space applications. Their space rover will traverse up to 80,000 sq. meters, avoid obstacles, navigate, and locate different samples autonomously. The rovers' drive trains consist of two wheel pods, each having 2 sets of XL pulleys and belts which are powered by a 100W DC gear motor. The motors each drive a 90 degree miter gear arrangement, which allows them to sit inside each wheel pod. The belt drive expansion allows more reduction capability and shock absorption. Members of Team SpacePRIDE will compete in June at Worcester Polytechnic Institute. Details of the competition can be found at www.spacepride.com. With the donation from SDP/SI, SpacePRIDE was able to complete the construction of its "swarm" of robots for the competition. With less time having to be spent fundraising for these parts, SpacePRIDE has been able to dedicate more time to robotics education in a local maker space and in local public schools. Team SpacePRIDE will be in competition with 11 other teams for the grand prize of $3,000. SDP/SI is a leading manufacturer of small mechanical components, servicing a wide variety of aerospace, medical and commercial industries for over 50 years. Quotes, online orders, and 3D CAD Models are available at our updated eStore at: www.sdp-si.com/eStore. SDP/SI offers over 130,000 power transmission components including: gears, belt and chain drives, shafts, shaft accessories, bearings, couplings, universal joints, vibration mounts, miscellaneous components, hardware, gearheads and speed reducers, right angle drives, brakes and clutches, motors and gearmotors. For additional information about SDP/SI please visit: www.sdp/si.com.